Collaborative video project with Marius von Brasch. HD DVD, 05.00 minutes. The artists improvise visual mark-making, playing with string against and empty blackboard, and aural mark-making by alternately speaking random words. The problematic of ‘tuition’ becomes one, perhaps, of ‘intuition,’ as mute understandings form in gesture and response with the string, and in unplanned and unexpected word associations. Video performance with un-partnered beginner's cha-cha. Ambient sound. Looped HD DVD, 19:19 minutes. Moving up and down a harshly lit, long institutional corridor, a woman rehearses basic cha-cha steps. She repeats beginners’ mistakes in 'hold' position, losing and finding the beat, and hesitating and starting again. Improvising with limited steps and handicapped by lack of music and partner, she persists in trying to understand the rudimentary vocabulary of the dance, making rehearsal into performance. The piece speaks of an absence of connection and the idiom that life is not rehearsal. 2-screen HD video installation, 04.00 minutes, looped. Ambient sound. 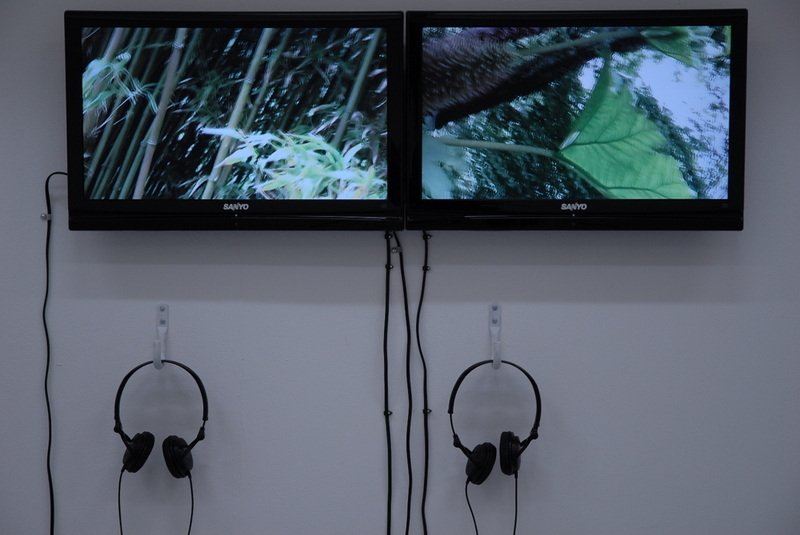 A double screen video installation shows the view from both hands, that is, from two handheld cameras, one in each hand, the arms hanging naturally beside the body. The footage is dictated by the cameras blindly moving with the arc of the arms' natural swinging motion while walking. By removing authorial planning of framing and focussing, the visual world comes in and out of focus, dissolving into abstract pattern, with moments of focus and clarity. Shot at Overbecks Gardens (National Trust) in Devon. Video performance with laptop and voice. 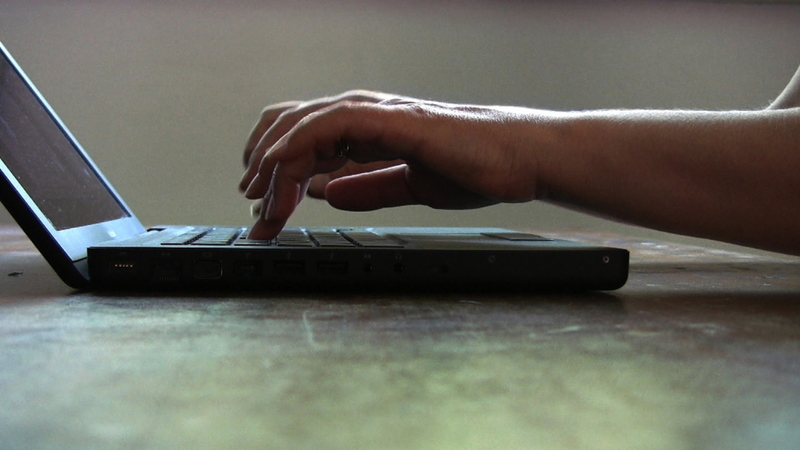 HD video, 04:00 minutes, looped. MA Fine Art degree show, Winchester School of Art (University of Southampton) 2010. 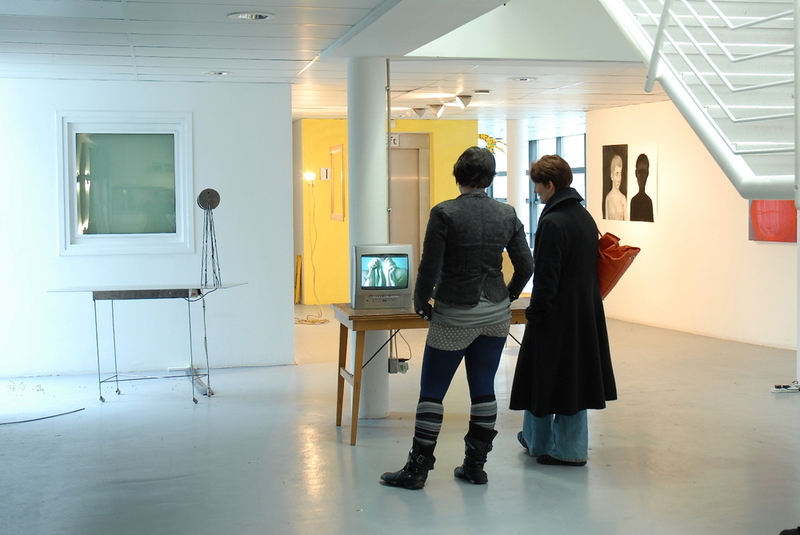 Exhibited: Pre.Sense, susan projects pop-up exhibition, Oxford, 2011. 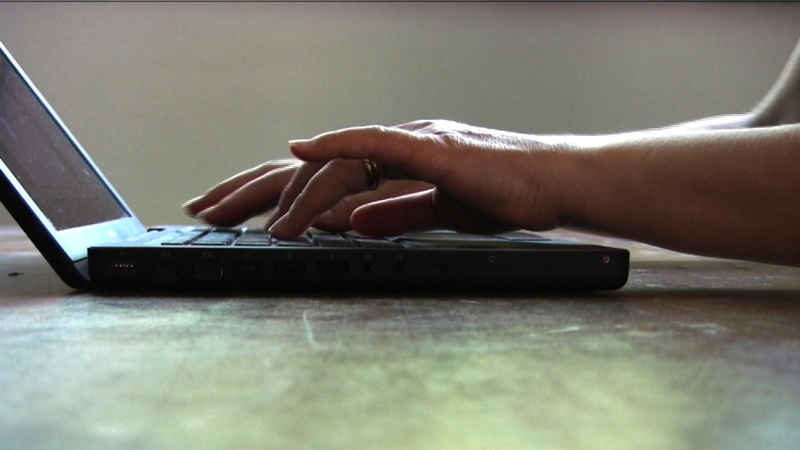 The contrast between touch-typing conventional text and a woman’s voice singing freely in unknown language suggests a gap between the language-like linguistic structures and their meaning. The work suggests the difficulty of putting some types of experience into words, or or finding words for the unsayable. 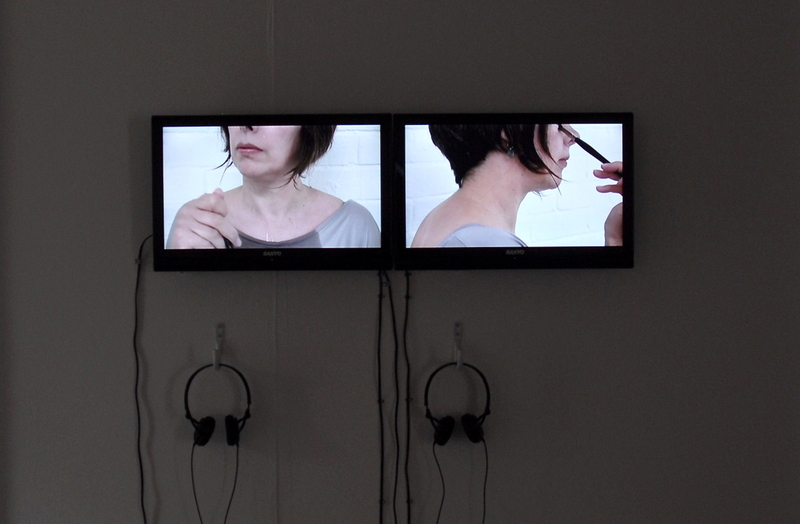 Video performance, with paintbrush, water and voice. 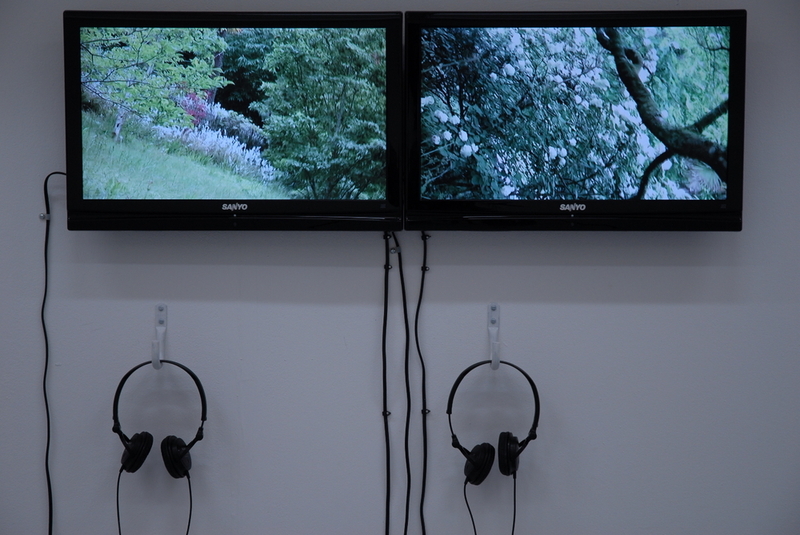 2-screen HD video installation, 03:31 minutes, looped. MA Fine Art degree show, Winchester School of Art (University of Southampton) 2010. A woman repeatedly paints her eyes and face with water, as if applying external tears. Tension arises between a private, ritualised enunciation of grief and the idiom (and sound) of putting on a brave face. Video performance with scale-model glider wings. 3-screen HD video installation, 04:00 minutes, looped. MA Fine Art degree show, Winchester School of Art (University of Southampton) 2010. Stills & installation shots. Trapped in woodland, the attempt to endure holding a large pair of wings steady, as if poised for flight, is gradually defeated by gusts of wind, hyperventilation due to the effort of holding arms raised, and loss of balance. Questions about how or whether to endure are left open, as are those about flight as escape. Ambient sound includes bird-song, the voices of passers-by and aeroplanes overhead. 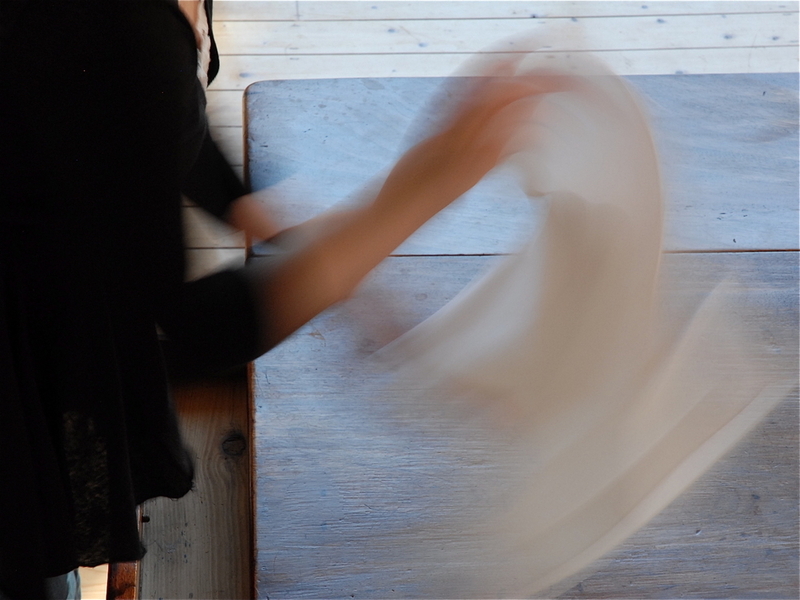 Video performance with twig and cloth. Looped DVD, 05:00 minutes. As a woman writes on her skin with a twig, the text increasingly appears as white trails on reddened skin. 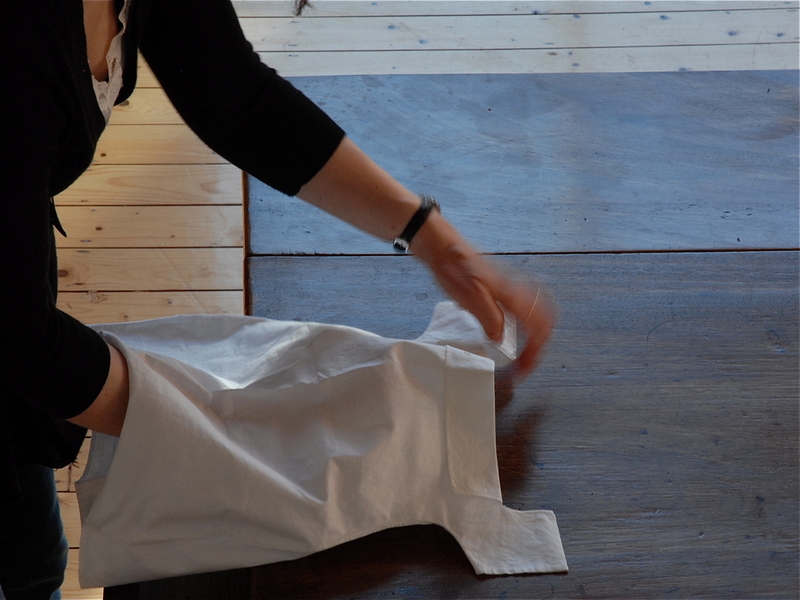 She tears skin-like cloth in two, and binds her hands with the cloth strips. Whether this is to fight, disable or heal, depends on how the viewer reads the real but vanishing script. 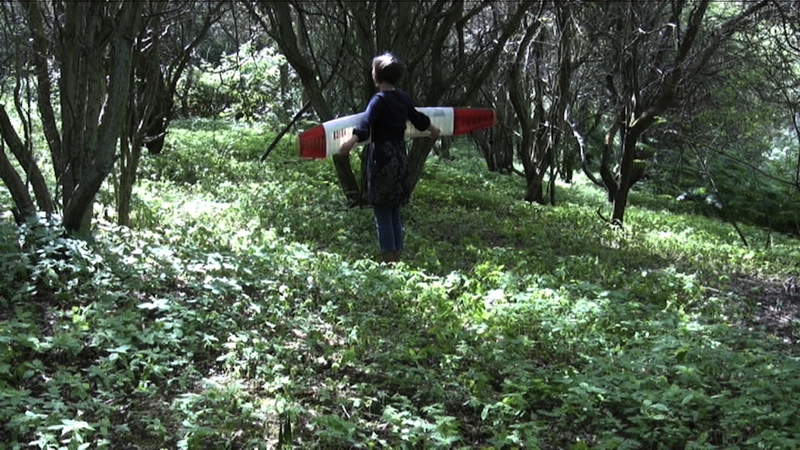 Video performance with scale model glider. 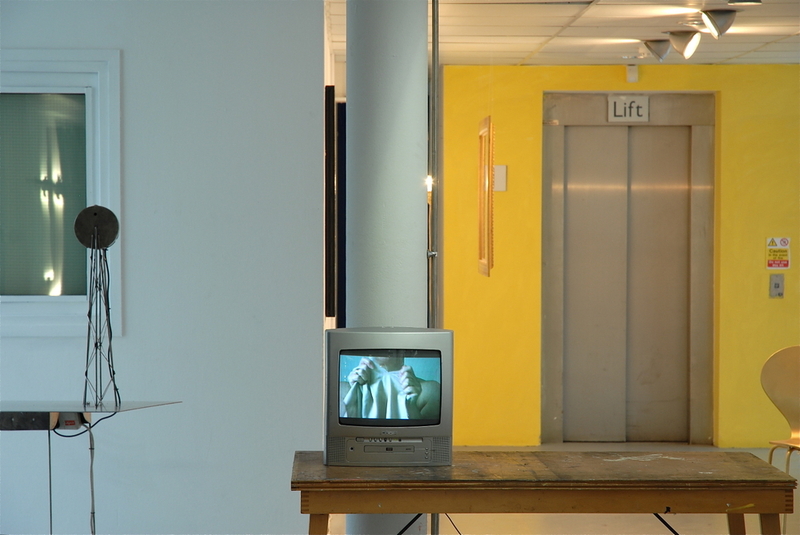 2-screen video installation, 03:00 minutes, looped. Two parallel but related performances show, on the left, the performer’s shadow carrying separate pieces of model glider up and down stairs, while an adjacent wall echoes the flickering light. Fragments of the transparent red wings and the performer’s actual body - an arm, a hand - enter the frame but seem more fugitive than the shadows and the steadily flowing light. In the right-hand video, the performer lowers the plane from imagined flight and detaches the wings. Visual echoes of Icarus, and pirouettes hampered by wings, suggest a complex relationship with metaphorical flight and freedom. Time-lapse performance photographs on video, 04:46 minutes, looped. Stills & installation shots. Exhibited: Re-imagining Treasures of Hyde Abbey, 2010, Winchester Cathedral. Repeated folding and unfolding of a 19th century baby shirt articulates the tactile-emotional aspects of lost relationships and missed encounters. Five short chapters imply both the difficulty of letting go, and the possibility of knowing how to go on.